The primary reason for Specter's switch? This time I checked Dave's blog first, just to be sure.... I believe, therefore, I can claim, with some confidence, to be the last blogger in America to comment on Sen. Arlen Specter's switch from the Republican to the Democratic Party. It's an item I saw in Sneed's Chicago Sun-Times column this morning that prompts my comment: She reports that Joe Biden brokered Specter's switch; Specter's call to the White House announcing the change came as a surprise to President Obama. I've previously mentioned reading Specter's book, Never Give In. In the book, Specter attributed his bout with Hodgkin's disease to the stress of a difficult primary campaign and the obstacles he encountered as he sought to take the reins of the Senate Judiciary Committee. He was facing a re-run of that primary contest this time... and he was even less popular now with conservative Pennsylvania Republicans than he was in 2004, thanks to his vote in favor of President Obama's stimulus package. Sneed's column this morning made me recall something else from Specter's book: He wrote warmly of his personal friendship with then-Senator Joe Biden, despite their disagreement on various issues. They frequently traveled together to and from Washington, on the train as I recall, and had plenty of time to converse privately... and to bond. Publicly, the Democrats are euphoric over all this: Specter represents the magical 60th vote (assuming Al Franken is eventually confirmed in the Minnesota recount) that will allow the Democrats to throttle Republican dissension once and for all. I wonder how long they'll remain happy. Specter switched because he would have lost in the Republican primary. Primaries -- in Pennsylvania no less than anywhere else -- are the refuge of the true believers. Doctrinaire candidates will generally fare better in primaries than perceived fence straddlers. True believers -- conservative or liberal -- tend to view any deviation from their stated priorities of the moment as waffling, pandering, or treason. Because Specter was likely to fall in the primary, Democrats would probably have picked up the seat in 2010 anyway -- unless things change drastically between now and then, a possibility which must always be acknowledged -- and they would have had a more 'reliable' vote in anyone other than Specter. Specter aggravated Republicans because he broke ranks with them on so many issues. But not all issues. It's on those issues he may break ranks with the Democrats. In the short run, Specter's switch boosts his friend Biden in the White House pecking order. But the lift may not last. And the Obama administration will still probably have to back Specter in 2010, just as Bush had to back Specter in 2004. All swine flu... all the time? The word "pandemic" is rendered in quotes in the preceding paragraph because this is the word being used -- or rather badly misused -- in so much of the breathless media coverage. Sure, this latest virus may yet become a pandemic; in our crowded, connected world any outbreak of contagious disease has that unhappy possibility. But it ain't there yet. Oldest Son was waxing cranky about this as we Google-chatted during yesterday's lunch hour. "Please put your mask on before you continue typing," I cautioned him. I sprayed Lysol on my keyboard and screen whilst waiting for his reply... just in case. "This is panic over nothing," harrumphed Oldest Son. At least his typing appeared like a harrumph in the corner of my screen. "That's because you're too young to remember 1918," I typed. OK, I guess he had me on that one. "Besides," he added, "we don't use leeches any more." "They didn't use leeches in 1918 either. And this is a virus -- antibiotics aren't going to help. Tamiflu reduces symptoms for some people, but not all. So we're not as far ahead of 1918 as you might think, smart guy." Our conversation thereafter drifted to other topics... but the swine flu has stayed on my mind. How can it not? Every TV channel and radio station is bleating about it at this very moment. For people like me, this is disaster. A million years ago, when I was but a lad, we had only three TV networks. A staple of network television in those far-off days was the made-for-TV movie. This was a way for a network to fill up a goodly chunk of time without investing in a series. A favorite topic of these movies was loathsome disease. My father referred to these as the 'disease of the week' movies. I was soon banned from watching them. If the hero broke out in green spots, I was sure I had green spots by the second commercial break. If the protagonist saw purple spots before his eyes, so did I. I had a classic case of cathode-ray contagion -- which was cured only when my parents forbade me to watch any more of these movies. But the cure is only temporary. With all this blather about swine flu... I'm feeling faint and feverish. If you must leave a comment today, wear a mask. For both our sakes. I may also be the last blogger in America to weigh in about Twitter. It seems that everyone and their brother is into Twitter... so Twitter must be here to stay, right? Anyway, our conversation on this trip back to school had drifted to the topic of text messages. Younger Daughter told me that she shows my text messages to all her friends. She told me that all her friends find my text messages screamingly funny. My daughter's statement about how much her friends like my text messages seemed like an opportunity for me to trot out another popular culture reference. So I answered, "Maybe I should set up a Twitter account. I'd tweet my text messages to you and your friends could sign up to be followers." "What?" my daughter asked, finally. "What's Twitter?" I explained that it is a micro-blogging service... where people can advise of things that happen to them (in 140 characters or less) as many times a day as they want. Younger Daughter was still silent. "It's like changing your Facebook status, only people follow the changes on their cell phones." "Oh. I see. It's so funny you know about Facebook status." But not another word about Twitter. If Younger Daughter doesn't think Tweeter is the greatest thing since indoor plumbing, I'd steer clear of any Twitter IPO... should there ever be one, that is. Here's the link to the original XKCD comic posted above. The artist, Randall Munroe, usually embeds an additional sarcastic remark in the original cartoon. 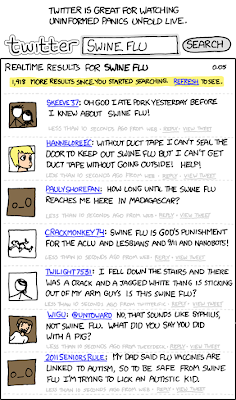 The embedded remark does not copy when I lift the image... so I encourage you to visit the XKCD site. Is it still tea [bag] time? Allow me to be the last blogger in America to weigh in on the April 15 'tea party' protests. Depending on your own political persuasion, these were either a made-for-Fox-TV fraud or a spontaneous uprising of the overtaxed majority. I suspect that both of these positions are partially true, and partially false. I was not among the tea-baggers on the 15th. I had a deposition. I was earning money (I hope) to pay the taxes the others were protesting. A friend of mine sent me a link to the sneering CNN coverage; my friend (who was at the Chicago gathering) claims that the event shows a great and dangerous anger out there toward all incumbents. I'm no great fan of taxes either. My father always said that withholding was the greatest thing that ever happened to government: If the majority of people actually had to write checks for the money the government was taking from them, no politician would ever get reelected. As a self-employed person, I've been writing checks for my own withholding for nearly 11 years now -- 'matching' my own FICA 'contribution' as employer and employee. For a good decade before that I was saving up money from my income to pay quarterly income taxes: As a partner in a firm, I wasn't subject to withholding. (And wouldn't you just know it? Cash flow always seemed most constricted just when the quarterly returns were due.) Come to think of it, I've been a pretty consistent contrarian in the voting booth for a long time now. But even I still admit, however grudgingly, that taxes are a necessary evil: I can't provide so much as the nose gear of an F-35 on my own. I'm afraid that I couldn't maintain the Interstate highway system on my own either. I suppose I could save up to send an ambassador to Baghdad -- but I couldn't maintain an embassy for him or her, much less pay an appropriate salary. I don't think the tea-baggers are against all taxes either, although some particularly inarticulate and frightening people were selected to represent the various groups on the evening news. I think people expect there to be a relationship between the taxes we pay and the services we get: The aforementioned F-35s, for example, or the continued viability of the Interstate highways. I certainly expect a certain amount of waste -- stupid programs, bridges to nowhere, civil service sinecures for politicians' relatives. Human beings are not angels. But I and, I think, most people expect a certain positive correlation between the dollars extracted from our pockets and the services government provides in return. Sad to say, the expectations of all but the most tolerant among us have been shattered by the events of the last several months: Our government is shoveling money in carload lots at banks, insurers, and auto manufacturers because, for varying reasons, bankers, insurers, and auto manufacturers ran their respective businesses into the ground... because our beloved government believes these entities are too big to fail. And what did we get for our money? The tea-baggers had a point: The government seems to have borrowed recklessly to save businesses too stupid to succeed... and left most of the people responsible for their problems in place to repeat their errors at the earliest opportunity. Congress (which had the leading oar in both administrations' bailout packages) has acted rashly and stupidly and the rascals should be turned out. But people are fickle. Most folks have short memories. If people have jobs, if the price of gas doesn't go up too much anytime soon, people will probably return their beloved congresspeople to office in 2010. I know they're counting on this in Washington. Yes, I note that I've not posted since last Tuesday. And this will not be a substantive post either, I'm afraid. Nothing is wrong. I am simply swamped at present with work and other obligations. 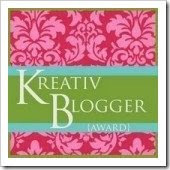 I have not fallen off the wagon... or climbed aboard, depending on what you think fuels these blog posts. Regular programming will resume at the earliest possible date. It is, you know -- I mean, '86' is a verb. You can look it up on Dictionary.com right now if you think I'm pulling your leg. In restaurant or tavern parlance, to 86 someone is to refuse that person service; more generally, it means to eject or discard someone or something. (That VCR has given up the ghost; we'll have to 86 it.) The American Heritage Dictionary definition quoted on Dictionary.com says that the word may have been derived from "Chumley's bar and restaurant at 86 Bedford Street in Greenwich Village, New York City." Younger Daughter had her wisdom teeth pulled Thursday. We had to bring her home from her dorm Wednesday night so she could get to the oral surgeon at the crack of dawn. So she was on heavy-duty drugs from mid-Thursday on... and she brought home laundry. Older Daughter had a bridal gown fitting on Friday afternoon; she drove up from Champaign for the event. Long Suffering Spouse accompanied Older Daughter. The purpose of this exercise was to find out what sort of alterations would be necessary to a gown that had been exhaustively measured and specially created according to these measurements only 60 days or so ago. Alterations are always necessary... and quite expensive. And there was a bit of a bait and switch concerning the veil. In general, bridal shops employ business tactics that would shame Somali pirates. Oh... and Older Daughter brought home laundry. Hers and her fiance's. The Fiance (generally referred to in these essays as Older Daughter's Boyfriend) came in Saturday evening. His laundry, you'll recall, has already been accounted for. Meanwhile, Middle Son was pitching the first game of a doubleheader Saturday. He called Friday night to let us know; after all, he wanted his parents to come and watch... and, oh, by the way, could we bring both cars? And the spare key for one of them? That way he could come home after the second game. Youngest Son had a game Saturday afternoon, too, and it was scheduled to start about the time his brother's would conclude. In a perfect world, I would have gone from one game to the other because Youngest Son also pitched. But Long Suffering Spouse didn't come with me to Middle Son's game. She was frantically cleaning house and baking because Oldest Son was coming to dinner Sunday. No, not with his laundry. Although I could understand why you might have thought that. Long Suffering Spouse feels she just doesn't know Oldest Son's Intended. And she wants to try and get to know the young lady better... but Oldest Son's Intended has not really warmed up to us. Oh, she's polite and correct and seems very nice. And she's a great influence on Oldest Son. But... I think... Long Suffering Spouse would like the opportunity to have a grown daughter that she didn't have to fight with throughout the tweens and teens etc. My poor wife really wants to make a good impression. Good impressions involve both cleaning and baking, though I don't know why: Baking alone does it for me. But the decision was made. Long Suffering Spouse would not come with me to Middle Son's game. Older Daughter would come get me after awhile -- so I could watch the game and leave the key; Older Daughter would then chauffeur me to Youngest Son's game. I called home about the sixth inning to let Long Suffering Spouse know how her son was doing and to see if Older Daughter was on her way. Long Suffering Spouse answered the phone... and she had just come out of Youngest Son's room. The clothes everywhere are typical of the teenager of the species... but the empty two liter pop bottles? The empty cans? The Gatorade bottles? The candy wrappers? Long Suffering Spouse had moved beyond stressed. Loyalty required that I refuse to go to Youngest Son's game. I must instead insist on coming home so I could offer support, encouragement and try not to get killed. And that's what I did. And I moved what had to be moved and washed as directed, too. Anyway... we were finally all in position for Easter morning. And we'll get to that... later. 97% of all email traffic is spam? Jacqui Cheng reports on Ars Technica that spam now accounts for 97% of all email traffic. You may have a different perception. If you're like most people, you probably think that around half of your inbox is taken up by jokes and chain letters from friends, relatives and work colleagues. According to the Microsoft security report analyzed in Ms. Cheng's article, this is because "most [of the spam traffic] never made it to their destinations thanks to server-side filtering." The only thing I know for certain about spam filters is that they don't always work: The pleas from widows of Third World generals and solicitations for pharmaceutical products too often get through and -- sometimes -- actual work stuff does not. Like the time my opponent needed extra time to file a reply brief. She'd insisted I email my response because there was a tight briefing schedule, and I did -- but it got stuck in her spam filter. (from a very strange site called Married to the Sea). Sure, at the time, when the markets were booming, the cartoon was funny because these nice-looking people were sooooooooooo out of it. Why didn't they invest in stocks? Mortgage-backed securities? Bernie Madoff's fund? Looking back... would the nice imaginary couple really have been any worse off going with the 'gentleman from Africa'? I suppose that's not an argument to let more of the 97% through. But every day I'm less and less sure. Programming Note: I don't know if I'll be able to close my office tomorrow, but this blog will be closed for Good Friday. Happy Easter. What if the Baseball Writers decided entry into the Basketball Hall of Fame? 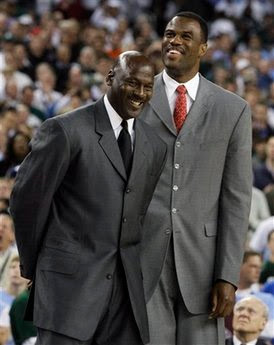 In one of the biggest non-surprises of recent memory, Michael Jordan (shown above with David Robinson Monday at the NCAA Championship game) has been elected to the Basketball Hall of Fame. Obviously, the man who is perhaps the greatest basketball player of all time belongs in the Hall of Fame, right? But... the news got me thinking... what if entry to Basketball's Hall of Fame were guarded by the Baseball Writers of America? It is the baseball writers who decide, in the first instance, who may be enshrined in Cooperstown. Unless 75% of the writers with voting privileges agree, no one gets in... at least not until after their 15 years of eligibility are up and the veterans' committee, maybe, lets them in. Now... Jordan had an anemic career .202 batting average during his one-year baseball sabbatical... but I'm not talking about that... not directly, at least, as shall be seen. But what it basketball writers had the same privileges and attitudes as the baseball writers? Would Jordan have gotten in the Hall on the first ballot? "Well, I never vote for anyone on the first ballot," says one, reaching for the tray of sandwiches in the middle of the table. "Me neither," says another, daubing mayonnaise first off his chin and then off his tie. "C'mon fellas," says a third (the group is almost exclusively male), "if Jordan doesn't get in first ballot, who does?" "We have a responsibility," says a fourth, and at that several of the assembled writers put down their malted beverages and nod gravely in assent. "You're not suggesting... steroids, are you, McGuffy?" "No," says the fourth speaker, now positively identified, "not that. Of course, Jose Canseco wore spikes, not sneakers, so we'll never know for sure." More nods. "But there were rumors of other problems." "Gambling," says a round-faced man with a bad comb-over. "He gambles like crazy. Golf, casinos, you name it." "Yes," said McGuffy, "gambling. And did he really leave basketball to play baseball for a year because he had a burning desire to try to make it in that sport, too, or because it was a plea bargain with the Commissioner's office?" "What are you saying?" asks Comb-Over. "Just this," says McGuffy, "there was talk at the time that Jordan was under investigation for betting things besides golf." "Pete Rose," someone wheezes, and the more religious among them cross themselves. Two other guys reach for the last sandwich at the same time. "Maybe he was suspended for a year," suggests McGuffy, "only the Commissioner didn't have to announce it because the Bulls found him a good excuse." "Well, I'm voting for him anyway. He's the greatest basketball player ever born." "I never vote for anyone on the first ballot," says the first person who spoke when we joined this little meeting, repeating himself, and not for the first time. And so it was that Michael Jeffrey Jordan, arguably the world's greatest basketball player, was denied entry into the Basketball Hall of Fame, receiving only 63% of the necessary 75% required for admission. "Probably next year," offered one writer in response to the outraged public. "If nothing surfaces in the meantime," said another. Abortion almost never medically necessary to save a mother's life? That's the perhaps startling conclusion asserted by a doctor in a letter to the editor I read in this morning's Chicago Sun-Times. I want to quote the letter in its entirety... but let me provide a little background first. There is pending now, in Illinois, a proposed Reproductive Health and Access Act, House Bill 2354, co-sponsored by roughly 30 state legislators*, and therefore more likely to be enacted, either in this session or one in the near future, than most of the chaff that gets filed in Springfield. The Sun-Times editorialized in favor of the bill on March 30. There are a number of controversial provisions in this bill. It would, for example, require state-funded Medicaid to pick up the tab for all abortions, not just those deemed "medically necessary." It would require that all Illinois public schools teach "medically accurate, age appropriate, comprehensive sexual health education." But perhaps the most controversial provision of the bill is that it would impose obligations on health care providers who are morally opposed to abortion to nevertheless provide "timely, accurate, and complete information about the patient's [reproductive] care options in a balanced and professional manner." Noting the vehement objection of the Catholic Church, the Sun-Times said, "doctors and other medical personnel still could refuse to perform certain services that are part of the accepted standard of care in reproductive health medicine. They would be required only to provide 'accurate and unbiased information' and referrals elsewhere -- as called for by the American College of Obstetricians and Gynecologists." Under the proposed statute, a failure to do so might cost the professional his or her license to practice and subject his or her employer (a Catholic hospital, say) to damages in a lawsuit. And who will decide what is "accurate and unbiased"? Doctors? Doctors who perform abortions? Bureaucrats (some of whom may hold M.D. 's) with a certain predisposition, say, toward the desirability of abortion? As with the administration's recent decision to permit unfettered research on embryonic stem cells, I fear that bills like the Reproductive Health and Access Act have almost nothing to do with medicine or science and everything to do with politics. But I find it hard to sift through the emotion on both sides to get at the real facts beneath. Still, I keep looking. I write in response to your editorial of March 30 ["Women have a right to be told of abortion option"]. As a physician practicing in the field of neonatology, I was deeply troubled by your conclusions as well as by the medical misinformation you provided to the public. You erroneously state that women are put at risk when they are not offered "emergency" or urgent abortion as an option for their pregnancy. You use the example of rupture of membranes early in pregnancy, and state that abortion is a "recommended option." In fact, surgical abortion, which mutilates the fetus and also poses some risk to the mother, is not the best medical option in this situation. Expectant management and use of antibiotics is. The majority of time the woman will miscarry -- a far more natural event than an abortion. Furthermore, approximately 10 percent of the time the hole in the membranes can seal up and the pregnancy can continue to viability. The protocol followed in Catholic hospitals in this scenario is a legitimate, valid and safe option for premature rupture of membranes, one that is best for both mother and child. Abortion performed to "save" a mother's life almost never -- if ever -- is necessary. Are pregnant women dying in Catholic hospitals, unable to get access to an emergency abortion? Of course not. In fact, Ireland -- a country where the unborn child is constitutionally protected -- has the lowest maternal death rate in the world. More than a decade ago, a group of Ireland's top obstetricians concluded that "there are no medical circumstances justifying direct abortion, that is, no circumstances in which the life of a mother may only be saved by directly terminating the life of her unborn child." The United Kingdom, on the other hand, where abortion is available practically on demand, has over five times Ireland's maternal death rate. Catholic hospitals and physicians do not offer abortion as a "treatment option," because abortion always ends the life of what medical textbooks -- used in secular medical schools -- refer to as the "second patient," namely, the unborn child. Why does the Sun-Times advocate forcing Catholic health-care workers to participate in such a practice they -- along with those of other faiths, or of no faith tradition whatsoever -- find so immoral? Should medical schools now post notices saying, "Catholics need not apply?" Would the Sun-Times be happier with Catholic hospitals -- a third of our nation's health care -- closing down instead? This is still the United States of America, a country founded on the principle of freedom of religion. Catholic hospitals and Catholic physicians and nurses should be able to refuse to participate -- in any way -- in a practice they consider to be immoral, unsafe and inhumane. I would link to Dr. Malloy's biographical information... I went looking for it when I got to the office this morning... but there are crazy people out here on the Internet and though the doctor has necessarily exposed herself to some of that craziness by being brave enough to assert her views in print, I don't want to directly contribute to the scorn she will almost certainly have to endure. Suffice it to say Dr. Malloy is on the faculty at the hospital; she's not a med student taking her new initials on a run around the newspaper. Her specialty is neonatology. House Majority Leader Barbara Flynn Currie (D-25) and chief co-sponsors Rosemary Mulligan (R-65), Naomi D. Jakobsson (D-103), Elizabeth Coulson (R-17), and Sara Feigenholtz (D-12). Today our beloved blogmistress (is that a word? )Barb, turns Heads or Tails into a numerology lesson: We are to "list three" -- three of anything apparently, persons, places or things. Three is an important number... in math, it is the smallest odd prime number. It is the only number that tort lawyers really understand: Every plaintiff's lawyer can divide by three. Trust me on this. There are Three Fates (Clotho, Lachesis, Atropos) -- go ahead! win a bet at lunchtime with this one, on me. There are three branches of the American government: Legislative, Executive and Judicial. Noah had three sons, Shem, Ham and Japheth. The three patriarchs of the Old Testament are Abraham, Isaac, and Jacob. When we read the Passion (this week being Holy Week) we are reminded that Jesus warned Peter that Peter would deny Him three times. And, of course, three is the number of the Trinity: One God in three Persons. Especially in a boat. Or walking into a bar. People will think they're joking. It will be especially awkward for you. Yes, the White Sox opener was canceled yesterday because of the snow storm we had in Chicago Sunday. Today, though, the game will be played... and the weather will be sooooooooo much better. Temperatures are expected to climb out of the high 30's... all the way to the low 40's. I will be out there today, courtesy of my friend Steve. He called yesterday afternoon to see if I could still go. He asked, "Will that Curmudgeon you work for allow you to take tomorrow afternoon off?" I know I'm supposed to do something with this... like make another list and tag people. But I have to be in Federal Court in 10 minutes. I hope to get back to this soon. Facebook time boosts employee productivity? And not just Facebook; letting employees sneak peeks at YouTube, Twitter, or play games while at work also boosts their productivity -- within limits. That's the counterintuitive conclusion reached in a recent Australian study according to the linked Reuters article (that I first saw on Yahoo!News). The study was conducted by the University of Melbourne. Dr. Brent Coker, of the university's Department of Management and Marketing, reports that "People who do surf the Internet for fun at work - within a reasonable limit of less than 20% of their total time in the office - are more productive by about 9% than those who don’t." It may not matter what sites the employees favor while browsing; the study seems to offer benefits for most "who engage in ‘Workplace Internet Leisure Browsing’ (WILB)." According to Coker, "This works because people can only concentrate for so long. "Short and unobtrusive breaks, such as a quick surf of the internet, enables the mind to rest itself, leading to a higher total net concentration for a days work, and as a result, increased productivity." But not, sadly, for all: Persons who suffer from an 'Internet Addiction' will be less productive if allowed to browse at work. Dr. Coker says, "Approximately 14% of internet users in Australia show signs of Internet Addiction – they don’t take breaks at appropriate times, they spend more than a ‘normal’ amount of time online, and can get irritable if they are interrupted while surfing." Not surprisingly, Coker says that, "WILB is not as helpful for this group of people - those who behave with internet addiction tendencies will have a lower productivity than those without." So -- we learn two lessons here. First, when your boss catches you reading this blog this morning at work, don't react with irritation. Instead, tell the boss that you're just boosting your productivity. You're willing to make this sacrifice to enhance your value to your beloved employer. Second, since we now know that reading Second Effort will boost most workers' productivity, tell your friends and family to read, too -- but not for more than 20% of their work day. (Tell them to linger in the Archives at night or on weekends.) Together we can turn the corner on this recession! Boy: No with my math. Parents and dispatchers may both find this amusing (hello, Linda). Looking at my desk: Warning! Warning! Danger, Will Robinson! I took over a PI case recently for a friend who's taken a new job and couldn't keep working on this relatively small matter. The carrier wants to settle, he says (so, too, says the carrier's attorney). But someone needs to make sense of the tangled medical and figure out what the case is really worth. That would be me, presumably. In this brave new world, the carrier subpoenaed all the medical records electronically. I obtained the secret password from my friend and downloaded all the giant .pdf files containing my new client's records with various medical providers. Now I know the kids can somehow look at this stuff on the screen and get an adequate handle on what's going on. I have to print out the pages. I bought an extra ink cartridge and spent some time this week printing all the stuff out. So far, though, it seems like my new client has a very involved medical history, and there are records of preexisting conditions and prior injuries going back a decade or more... and not one darn page in the bunch (that I've found so far, at least) about the injury which gives rise to this case. I need to spend a lot more time with this. I have a coverage case that's up next week in Federal Court. I'm just coming into a case that's been going on for a year or more; I'll be part of the third group of attorneys coming in to represent the client. Third group? In a case that's been pending in the Federal Court for awhile? That pile of paper isn't actually on my desk yet... the second attorney is holding the file until the last fee check clears. If I hadn't worked for this client before -- and had a good experience -- I wouldn't touch this case with a 10 foot pole. I have another matter I'm reviewing for a prospective client. I wrote about her initial call -- our very long initial conversation. She somehow found me on the Internet... and I wasn't entirely happy about it. Still, as I wrote at the time, sometimes just giving people a respectful hearing is the best service you can provide. We are, after all, attorneys and counselors. I never expected her to follow up with the promised documents. But... 10 days later... just when I'd about forgotten about the call... what pops up but multiple emails, each with multiple attachments? She waited two years before calling a lawyer... she says... (who knows? I might be attorney no. 10 or 15....) then waits 10 more days to follow up on documents.... Warning! Warning! Danger, Will Robinson! Anyway, I read the first draft, stopping at page five, shooting off an email threatening to strangle the young lawyer who'd drafted the paper. When I calmed down, I sent him some citations trying to guide him back into the track. And he says he 'gets it.' But that's what he said before he sent me the first draft. So... I'm kind of afraid to see the latest one. Warning! Warning! Danger, Will Robinson! Then there are two other matters, both from the same group of lawyers. (Generally, I prefer lawyers as clients... I tell people I "don't do retail"... but these matters are testing my preference to the breaking point. I can't comment much about these matters without potentially identifying them... but in both cases I'm going to have to spin straw into gold in order to achieve any kind of a good result. I don't like the odds... and I've been v..e..r..y careful to communicate just how problematic these two matters are... nothing short of the direct intervention of St. Jude may help in these cases... but my lawyer-clients are, so far, willing to pay for my troubles despite my full disclosures. And, no, my blogging in the morning when I'm theoretically at my most productive is not the illustration I'm hoping to make.... Anyway, in this otherwise entirely true story, we've disguised the name of the corporate behemoth in question so as not to embarrass anyone (or get me sued). We'll make up a name for the giant telephone monopoly... let's see now... how about AT&TT? Two men came to the Undisclosed Location the other day. One was 30-ish and swarthy. One of the lawyers with whom I share this space thought him "unshaven." The other visitor was older, gray-haired, and silent. My colleague got to the reception window first. I heard Swarthy Man say he and his companion were from AT&TT and I pirouetted, retreating to the comparative safety of my inner sanctum. My colleague told me later that Swarthy Man had no business card, though he flashed what may have been an identification card. Swarthy Man asked my colleague for his office phone number, then said that AT&TT has some great new deal that will save him all sorts of money on his business account (which, by the way, is with AT&TT). "Call this number," Swarthy Man directed and my colleague adjourned to his own office for this purpose. At least he left Swarthy Man and Old Silent Guy sitting in our lobby. I could hear (from my vantage point hiding underneath my desk) that my colleague was on the phone -- he put the call on speaker -- and I could tell he was on hold. He later told me that he was on hold for 20 minutes before he reached a person, a woman, who asked his permission to release all his account information to her. "Excuse me," my colleague said, "you're supposedly AT&TT. I am an AT&TT customer. Why don't you have my account information already?" I don't know how Swarthy Man rejoined the conversation. In the middle of all this, I suddenly recollected an important errand and bolted from the office. (I never said I wasn't a coward, did I?) When I left, Swarthy Man and Old Silent Guy were sitting in our lobby. One of them had a laptop out and was also apparently trying to make a speaker phone connection. My colleague told me, however, that when he declined Nebraska Lady's invitation to 'release' his account information, Swarthy Man became quite pushy and insistent. My colleague had had enough. He'd already called the Office of the Building to inquire whether these people were supposed to be wandering around loose. (I didn't hear this call; he did this quietly so Swarthy Man and Old Silent Guy wouldn't know.) Anyway, my colleague directed our visitors to the Office of the Building and suggested they peddle their fish there. I got back shortly after they'd gone. My colleague was still upset about the whole thing. "My BS-meter was going off the scale," he said. "I was very uncomfortable." He paused. Then he smiled. "Good thing I used your name and phone number, isn't it?" "Thanks ever so," I said. But this is not quite the end of the tale. My colleague called the Office of the Building back to see if the building manager had anything further on these two men. "They're still in her office," he told me. Then, a few minutes later, a young woman came into our office. My colleague wasn't about to leave his desk any more so I went to the reception window. "I'm from AT&TT," she said. "AT&TT has already been here and gone," I told her. "I got separated from them. Do you know where they went?" "Try the Office of the Building," I said. I was not at my warm and fuzziest. "I just came from there," she said, and left. The phone company allegedly sends three people, in a tag team, to push their own customers to sign up for different, allegedly cheaper services. It's one thing to undercut a competitor's price... but your own? Does that make economic sense? They were either from the giant phone company... or they weren't. Either way, whether scam artists or salesmen, they were way overstaffed. Now, I'm all in favor of Americans having -- and keeping -- jobs... but sending three people out to do a job that one could do sure seems wasteful to me. Let's pretend this wasn't a scam: Wouldn't it make sense for the phone company -- if it's going to send salesmen into a building -- to have a list of customers and phone numbers? That way, when they get to Suite 1522 and Mr. Smith answers the door, they can look up Smith's name and see that his phone number is 555-xxxx. But this tag team didn't know my colleague's number (or mine, I guess, depending on whose name he really used). This sales committee had no authority to do anything on its own, apparently, even with the nifty wireless laptop they were toting about. No, they had to make the customer call Nebraska Lady -- who also didn't have customer information and had to ask for its release. Of course, at this point, like my colleague, you the reader may suspect that this was a gang of scammers, possibly from some fly-by-night phone company, but not from AT&TT. I certainly was inclined to this view... until I considered one important point. The one thing that makes me think that this group really was from AT&TT was that, when my colleague called the number as instructed, he was put on hold for 20 minutes. Now: Don't you think this says something about why our economy is in its present state?